4 October 2018 – South Africa’s Strategic Water Partners Network (SWPN) – the national multi-stakeholder partnership established by 2030 Water Resources Group in 2011 – co-hosted the 4th Annual Water Stewardship Conference in Sandton, South Africa, on 4th October 2018. The annual event showcased examples demonstrating how investing in South Africa’s water sector creates jobs, spurs local economic development, and delivers a host of social benefits ranging from improved water quality to climate change mitigation and adaptation. SWPN, together with GIZ/International Water Stewardship Programme (IWaSP), the National Business Initiative (NBI), and the Royal Danish Embassy convened over 130 senior representatives from the water sector including senior officials from government, industry, finance, civil society and development organizations. 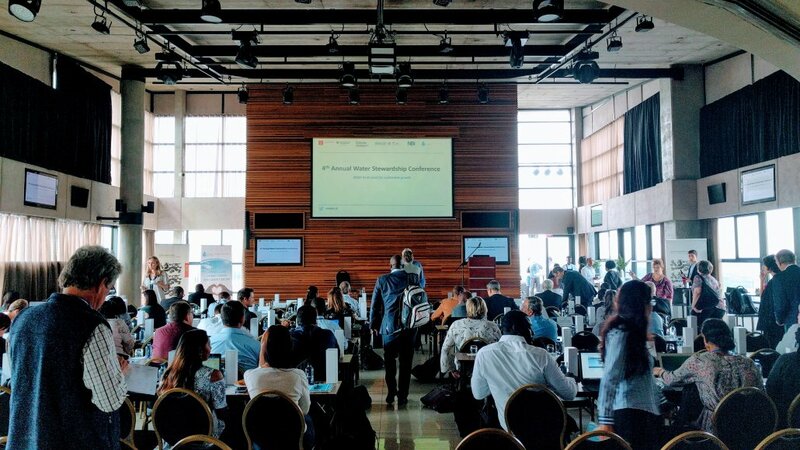 Attendees explored how best to leverage the full potential of investments in the water sector amid an ongoing water-shortage crisis, slow-growth economy, and R33 billion a year funding shortfall over the next ten years for the National Water and Sanitation Master Plan (NWSMP). “Only by working together to tackle prioritized challenges can the water sector ensure that South Africa will indeed be ‘Ready for the Future and Ahead of the Curve’” said Trevor Balzer the Deputy Director General Department of Water and Sanitation, referencing the collaborative approach that was promoted by President Ramaphosa during the launch of the Economic Stimulus and Recovery Plan, which pursues, among other priorities, the reprioritization of public spending to support job creation and investing in municipal social infrastructure improvement. Case studies featured during the event showed how strategic investments in the water sector could be deployed to unlock additional economic opportunities without additional spending. A study of a municipal-level groundwater management scheme in Blouberg Local Municipality, for example, used the project’s financial data to create a model that mapped project expenditure alongside various socio-economic outcomes. The results suggested that restructuring current expenditures to shift spending away from capital outlays and into operation and maintenance of existing groundwater schemes can act as a catalyst for local economic development. “The starting point is how can we make existing resources go further? Between us, as local and international public and private sector, national government, and local partners, we have the capacity to make this happen” said Jørgen Erik Larsen, Counsellor for Water, Energy, Research and Innovation at the Royal Danish Embassy. “We need to invest more in operations and maintenance with a “fix it first” approach,” rather than focusing exclusively on delivering new infrastructure. The Strategic Water Partners Network (SWPN) is a public, private, and civil society partnership whose members work collectively to close the 17% gap between water supply and demand that is anticipated to manifest in South Africa by the year 2030 unless action is taken to manage the country’s water resources more sustainably. The SWPN convenes stakeholders, carries out participatory problem and opportunity analyses, and develops, incubates, and scales out projects to improve water security in South Africa.